Professors Craig Mellis and Elizabeth Elliott. 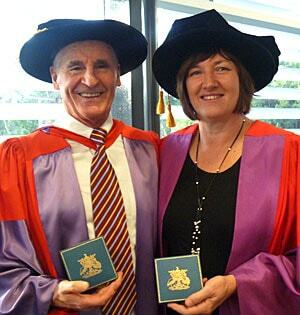 Two University of Sydney professors have been awarded top honours by the Royal Australasian College of Physicians. Professor Elizabeth Elliott and Professor Craig Mellis were both awarded a prestigious John Sands Medal for their outstanding service to Fellows of the College and its faculties. In presenting the award to Professor Elizabeth Elliott, the College said she had made a substantial contribution to paediatrics through her clinical work, research and involvement with the Australian Paediatric Surveillance Unit (APSU) and the Royal Australasian College of Physicians. A professor of paediatrics, Elizabeth Elliot's research work has covered a diverse range of topics including foetal alcohol, spectrum disorder, infectious disease, and gastroenterology and injury prevention. She was acknowledged for her leadership role on a number of boards and committees - positions she has held at an international, national and state level. She is the current president of the Paediatric Research Society of Australia and New Zealand and director of the APSU. Fellow recipient, Professor Craig Mellis was acknowledged for his outstanding and lengthy medical career in clinical care, teaching and research, and in the field of paediatric respiratory medicine. The College cited Professor Mellis's excellence as a clinical epidemiologist and biostatistician in the broader field of respiratory medicine as a reason for his award. This work has earned him an international reputation in the adult respiratory medicine world the college said. The College also stated that Professor Mellis had positively impacted generations of medical graduates and trainees, whether in paediatrics or adult training programs, and he was a great example of a leader among physicians.